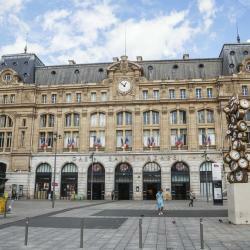 Looking for hotels near Victor Hugo Metro Station? Located just a 15-minute walk from the Champs Elysees, the elegant Residence Foch hotel offers charming accommodations and a lounge and bar area. Longchamp Apartment is located in Paris. The Arc de Triomphe and the Eiffel Tower are within a 19-minute walk and 1.1 miles of the apartment, and free WiFi is provided. Just 656 feet from the famous Champs Elysées and 1312 feet from the Arc de Triomphe, Hotel Ekta is located in Paris and offers free WiFi access throughout. Rooms are well designed, equiped and clean. Staff is very responsive. Just 1312 feet from the Arc de Triomphe, the Peninsula offers a spa, a 22-yard indoor pool and a rooftop restaurant with 360° views over Paris. Location is perfect. Service is unbelievably good. Located a 20-minute walk from the Champs Elysées, the Saint-James Paris is located an elegant 19th-century building set in its own private garden. The place is amazing. Beautiful garden, awesome places to have breakfast, lunch & dinner. Located in Paris’s chic 16th arrondissement, a 15-minute walk from The Eiffel Tower, this hotel offers air-conditioned rooms and a bar. The Arc de Triomphe is 0.6 mi away. Intimate, romantic, secluded, stylish and in a great location. Definitely coming back. Set in a 19th-century Haussmannian building, the luxurious Hotel Keppler is just 1312 feet from the Champs Elysées. It offers a fitness center, a sauna and a hammam, as well as a 24-hour front desk. Very trendy hotel convenient to everything. Located in Paris, Hotel Cecilia is 1148 feet from Place de l’Etoile and the famous Arc de Triomphe. Free Wi-Fi is available. Bathroom big enough, great for this price. Stella Etoile is in the heart of Paris. It is just 215 yards L’Arc de Triomphe and a 5-minute walk from the Champs Elysees. It has modern accommodations and free Wi-Fi access throughout. Nice hotel. Friendly staff. Room is comfortable. Location is perfect. Hôtel Galileo is 460 ft from Avenue des Champs Élysées and a quarter mile from the Arc de Triomphe. It features comfortable and stylish accommodations, and free Wi-Fi access. Loved the location of the hotel, just off the Champs Elysee, close to the Arc de Triomphe. Hotels with great access to Victor Hugo Metro Station! Located a 2-minute walk from the Champs-Elysees and the Arc de Triomphe, this 5-star hotel offers luxury accommodations in the heart of Paris. Generous upgrade, kind staff and the property was a pinnacle of luxury and historic French decor.